A global survey, sponsored by Embarcadero Technologies, reveals 2015 will be a big year for developing business solutions with integrated “Things” – such as industrial sensors, drones, health monitors and smart buildings. The majority (84%) of software developers building “Thing” solutions in 2015 are targeting business markets, while only 16% are exclusively targeting consumers. In the survey of 1,040 developers, conducted by Dimensional Research, 77% of development teams will have IoT solutions in active development in 2015 and almost half of IoT developers anticipate their solutions will generate business impact by the end of 2015. 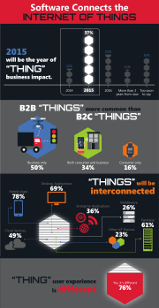 How will the Internet of Things impact business? What forces are driving development decisions around IoT solutions? What crucial development skill sets will be important when implementing IoT solutions? How will IoT solutions change the end-user experience? Please fill out this form to receive links to the whitepaper and infographic via email.